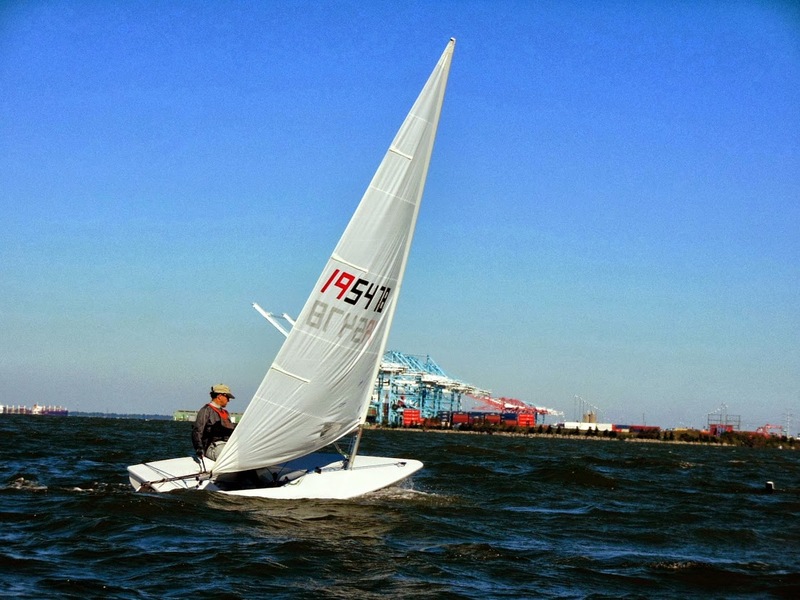 Fall series at ODU Sailing center runs through the first week of December. Racing starts at 11. Email robert.suhay [at ] pilotonline.com for more info. he six-week fall Laser series kicked off with perfect weather and a great turnout on Sunday. A shifty wind blew 10 to 13 knots out of the northwest, with clear skies, mild temps and water still holding onto a little summer heat – well mostly. Eight racers turned out and the racing was really competitive and fun. Old Dominion University ace Joe David was a step ahead on the shifts, locking up a string of firsts. Close on his heels was fleet newcomer Dixon Smith, back in the Laser for the first time in two years and definitely right back on the bicycle. Mike Moore mentions he was a star at the Naval Academy and he showed a lot of that form all day, especially on the downwinds were he put shoe to posterior. Daniel Blunt was undaunted in his second outing with the Elizabeth River crew and Richard Armstrong, Jim Shook, Frank Patch and Mike and I had some tight battles behind the leaders. It’s all the more impressive because the very lumpy conditions at the beginning of the day caused a little stomach distress, but with her usual gracious aplomb, Lisa put on a brave face and kept the action going. Races were held on a short, four-leg, windward-leeward course of about a half-mile with downwind finishes. Races took about 15 to 20 minutes apiece. I can recommend the two-ball, fast-racing format for dinghy racing if you are looking for a lot of starts and snappy tactics. The fast pace also cuts the pain when there is a wide range of speeds through the fleet and gives everyone plenty of chances to fight back and consolidate race lessons. Thanks to everyone who participated. You guys made it a great Sunday. Thanks to Old Dominion University Sailing for all of your support and help. And thanks to my wife, Lisa, who took care of the committee duty. Here are the results from 10-20-13: A little water blurred some of the numbers on race one, so if there are any errors, please let me know and I will adjust the series records. Hope to see everyone out next Sunday. Here are the details for the series again: Racing is at the Old Dominion University Sailing Center, off Powhatan Avenue in Norfolk, Va.. The center will be opened at 10 a.m., skippers’ meeting at 10:30 and racing will begin around 11 a.m. Racing will finish by 1 or 1:30 p.m. The six-week scored series begins in earnest on Oct. 20, same time and details as above. The series will run for six Sundays, endingNovember 24 with some awards and such. One note, the ODU Monarchs are hosting a regatta on the weekend of Nov. 3-4, so we will be running without a committee boat unless someone can help us out there.